I hope everyone is having an amazing winter so far. If you live somewhere cold like me (I live in Virginia, U.S.) Chances are you’ve probably already had a couple of snow days. We recently had our first semi acceptable snow storm of 2019 and got almost a foot of snow. One thing that I’ve learned though is that most people really hate the snow. Whenever I’m out in town before a storm it’s all people talk about and how much they aren’t looking forward to it. I don’t understand because I love the snow! It’s so beautiful and calming to me. It’s also super cozy. I love both going out on the town in the snow and staying at home watching Netflix or reading books. 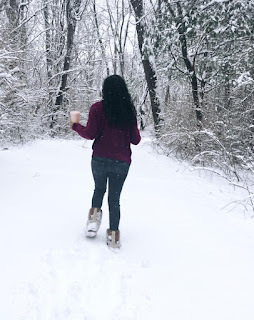 After being a stay at home mom and having tons of snow days I have plenty of ideas for what to do during a snow storm. First I want to give you my most important tip. To properly enjoy a snow day, always make sure you have everything you need to stay home for a day or two. Not just milk, eggs, and bread. Hit the store an pick up snacks, maybe a Redbox movie, or anything else you may need to keep you occupied. Some people think to only get the basic things but there’s so many more things to shop for in preparation for a storm. So, here are 10 Wonderful things to do during a snow day. Start your minimalism journey by de-cluttering your house. If you want to have a productive snow day rather than a lazy one, de-cluttering is an awesome way to start. Since starting my minimalism journey a couple of years ago, I have really taken a liking to de-cluttering. You never really know how much crap you have until your pull it all out and take a good look at it all. Start with something small and manageable like maybe your drunk drawer, under your kitchen sink, or something like that. The worst thing to do when de-cluttering is getting in over your head and not having the energy to finish or feeling overwhelmed by it all. Take a long bubble bath with your favorite bath bomb or a candle. It would also be a great time to listen to a podcast or audio book. I have had so much fun reading books lately. I actually prefer to take showers, so I will light a candle about 10 minutes before I get in the shower and just relax while listening to something that I haven’t had time to listen to before. Okay this is a given. Most people can’t wait to lay in bed, eat junk food, and binge watch NETFLIX on a snow day and really I can’t stress enough how relaxing it can be to do that. Not all snow days have to be filled with work and responsibilities. If you need some ideas for shows to watch, check out my recent blog post NETFLIX Shows I love to binge watch. I know that most people like to stay in during a snow storm, but I really enjoy bundling up and going out. Make sure you have a good coat, boots, gloves, and coat so that you are comfortable and If I were you I would grab a cup of hot chocolate to keep warm. If the roads are fine, drive to a place where you can walk and enjoy the scenery. If not, go for a walk around your neighborhood. I promise it's not that bad. This is probably a no brainer for those who read books all the time, but I only recently started to dive into books and I really have missed out all these years not reading. I love being taken to another world when I'm reading. It's so relaxing. You might not even realize that there are tons of ways to read books for free these days. If you have amazon prime or kindle unlimited, you have immediate access to thousands of books. This will require you to plan and shop for this ahead of the storm, but this is something that I often do. When I know there’s a snow day coming, I go on Pinterest and look for something new to cook. Preferably some sort of comfort food. Shop for the ingredients and then I make it for dinner. It’s fun because I often let the girls help me and they love cooking. If you are like many people and find it increasingly difficult to keep in touch with your friends because everyone is so busy these days, a snow day is the perfect day to do it. I wrote a post about apps that I love and one of the apps is an awesome video chat app that I use to keep up with my bestie who lives on the west coast. But if video chatting isn’t your thing, give them a call or send them an email. They will be happy to hear from you! The older I get, the more obsessed with skincare I become. I like to stock up on face masks and creams so that when a snow day comes, I can have an at home spa day. It’s so relaxing and I’m less likely to do it any other day. I kind of see it as a chore. I recently got an awesome 24k gold face mask that I’m obsessed with. You can read all about my favorite anti-aging skin care products as wellas celebrity skin care routines in this post. I love shopping online and so does everyone else I know. Looking for new furniture for your home but haven’t really had the time to do some real shopping? Need some new outfits for spring? Or some gifts for a friend? Take some time to find things that you like and compare prices, so you can get an awesome deal. Sometimes I find myself shopping at the same places repeatedly, that can be limiting because there are endless options on the internet. I know I touched on de cluttering earlier in this post, but one thing that can get super cluttered is our phones. Over crowded email inbox, thousands of pictures, lots of files we’ve downloaded, apps we don’t use…All those things are taking up precious space on our phones. Take some time to de clutter and you will be happy with the results. I promise. I hope you enjoyed these tips. It is snowing right now as I write this post. I personally love to go out in the snow, so the girls and I have already done our grocery shopping and we went swimming at an awesome warm water indoor pool as well. Just because it is snowing doesn’t mean you can’t have fun. The girls and I always have a blast. Just make sure you always drive slowly and keep a good following distance on the roads. Do you enjoy snow days? Do you like to go out or stay in? What are your favorite things to do on a snow day? Let me know in the comments.